Make the SFMGS Boho Spike Stitch Bag! Meet Miki from the Set Free My Gypsy Soul blog! If you haven’t discovered her gorgeously bright boho style yet, you’re in for a treat! Make her Boho Spike Stitch bag with her fabulous free tutorial! I just LOVE Spike Stitch! So much so, that it has almost become a SFMGS signature. It’s such a simple yet satisfying stitch that adds vibrance, texture and dimension to your projects. It’s also a stitch with endless possibilities… use alone, or in combination with your fave stitches in the round or worked straight… spike across 2, 3, 4 rows… it’s just so versatile! 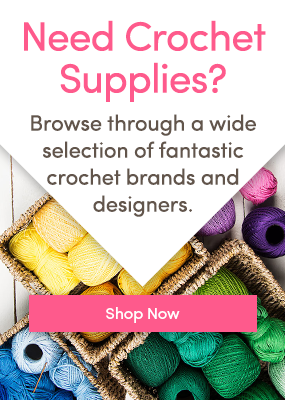 The stitch itself is an elongated regular crochet stitch and has many abbreviations… the part you are looking out for when reading a pattern is ‘SP’. I like to use SP-2, SP-3 or SP-4 as it clearly states how many rows/rounds to spike down into but you will also see it written as SPtr, SPtc, SPhtr, SPtc and so on. When you work two or more rows of the same colour together with a Granny Spike cluster the chevron zig-zag created is so eye-catching. It also creates a super cozy, warm and tough fabric… can you tell I’m just a little bit obsessed?! The way this fun Boho-inspired bag is constructed, together with the denser fabric created by using this stitch with a smaller hook and crocheting between the stitches means that unlike most crochet bags, it’s not going to stretch so you don’t need to line it if you don’t want to! Yay! SP-2 = spike stitch over 2 rows: spike stitch is an elongated crochet stitch. For SP-2, instead of inserting your hook directly into the row below, yarn over and insert the hook into the 2nd row below and complete the stitch. To create a denser fabric, this bag is made by crocheting into the spaces between stitches using a slightly smaller hook than recommended. A firm even tension is required for this project, but take care not to work too tightly to keep an even shape. Gauge is 4 tc st/inch. Keep a firm but relaxed tension when making your ch, don’t make your ch too tight. R1: With yarn A, make a slipknot and ch91. Dc into 2nd ch from hook. Dc into each ch to end. Ch1. Turn. R2: Dc into each st sp to end. FO. To make the SP-2 on R3, YrH and instead of inserting your hook directly into the row below, insert hook into the 2nd row below into the sp between the dc stitches of R1 and complete as a tc stitch. Follow with tc into the same st sp. Your SP-2 st will now be sandwiched between 2 tc st to make a cluster/shell, just like when you make a regular ‘Granny’ st cluster/shell when making Granny Squares or Granny Stripes. R3: Join yarn B. Ch3 as 1st tc. (tc, SP-2, tc) into next st sp. Repeat [(tc, SP-2, tc)] into every 3rd st sp to end. End with final tc into top loops of final st.
To make the SP-2 on R4, YrH and instead of inserting your hook directly into the row below, insert hook right through the centre of R2 dc st below and complete as a tc stitch. Now make your tc into the same space to sandwich in your SP-2. Repeat [(tc, SP-2, tc) into every 3rd st sp to end. Ch3, turn. Now your foundation is complete, after every 1st tc of the cluster when you spike down, YrH and instead of inserting your hook directly into the st sp below, insert hook right through the centre of the previous row’s SP-2 st and complete as a tc stitch. Then tc into the same space to sandwich in your SP-2 as before. R5: Miss 2 st sp. (tc, SP-2, tc) into every 3rd st sp to end. End with tc into top loops of final st of last row. Ch3, turn. R6 – 7: Repeat R4 and R5. At the end of R7, do not ch3 or turn. FO. R8: Join yarn C into 1st st sp. Ch3 as 1st tc. (SP-2, tc) into same st sp. Miss 2 st sp. Repeat [(tc, SP-2, tc)] into every 3rd st sp to end. Do not ch3 or turn. FO. R9: Join yarn D into top loops of 1st tc. Ch3 as 1st tc. Repeat [(tc, SP-2, tc)] into every 3rd st sp to end. End with tc into top loops of final st of last row. Do not ch3 or turn. FO. R10: Join yarn C into 1st st sp. Repeat R8. FO. Rows 11 – 54 will be using a 2 row repeat of R11 – 12. R11: Join yarn E into top loops of 1st tc. Repeat [(tc, SP-2, tc)] into every 3rd st sp to end. End with tc into top loops of final st of last row. Ch3, turn. Repeat [(tc, SP-2, tc)] into every 3rd st sp to end. R13 –14: Repeat R11-12. FO. R15 – 16: With yarn F, repeat R11-12. FO. R17 – 20: With yarn G, repeat R11-12. FO. R21 – 22: With yarn F, repeat R11-12. FO. R23 – 24: With yarn B, repeat R11-12. FO. R25 – 26: With yarn H, repeat R11-12. FO. R27 – 28: With yarn C, repeat R11-12. FO. R29 – 30: With yarn D, repeat R11-12. FO. R31 – 34: With yarn B, repeat R11-12. FO. R35 – 36: With yarn D, repeat R11-12. FO. R37 – 38: With yarn C, repeat R11-12. FO. R39 – 40: With yarn H, repeat R11-12. FO. R41 – 42: With yarn B, repeat R11-12. FO. R43 – 44: With yarn F, repeat R11-12. FO. R45 – 48: With yarn G, repeat R11-12. FO. R49 – 50: With yarn F, repeat R11-12. FO. R51 – 54: With yarn E, repeat R11-12. FO. R55: With yarn C, repeat R8. FO. R56: With yarn D, repeat R9. FO. R57: With yarn C, repeat R8. FO. R58 – 62: With yarn B, repeat R11-12. FO. R63: Join yarn A into 1st st sp. Ch1. Keep tension firm but not too tight. Dc into next st sp. Repeat [dc, dc, miss 1 st sp] to end. Ch1, turn. R64: Dc into each st sp to end. FO. With WS facing, lay work vertically and fold in half. Insert stitch markers into top and bottom st of R1 and R63. With yarn A and yarn needle, join together along seam. Still with work WS facing, fold top seam over 1 inch. Fold again. With yarn needle and yarn A, taking care to sew through the WS stitches only, sew together. R1: With yarn A, make a slipknot and ch66. Dc into 2nd ch from hook. Dc into each ch to end. End with 2dc in final ch to turn ‘corner’. R2 – 6: Without turning, continue dc into each st sp and 2dc into final st sp to turn ‘corner’. Join with ss and FO. With yarn A and yarn needle, and WS facing WS, sew seams together leaving 2 inches unsewn at either end. With yarn A and yarn needle, making sure the join is facing towards you, sew handles onto the inside of the bag at R17-20 and R45-48, yarn G.
Using remaining yarn, add fringe at 1 inch intervals and poms poms. Insert your hook through the st sp’s from underneath to pull yarn through and create neat knots. Find out more about Miki on her blog SFMGS and follow her on Instagram here! We’d love to see your Boho Spike Stitch Bags! Come and share your photos in the Community! Learn to Crochet the Spike Stitch! Free Bobble Stitch Cushion Tutorial! Free hexie tutorial from Steel&Stitch! Amazing Boho Wrap pattern! Miki is a self-confessed crochet addict, yarn hoarder and crazy cat lady. She loves bright colours and modern bohemian vibes, and shares weekly free mandala patterns on her blog. When she's not designing, she can be found squishing yarn, making crochet hooks, and restoring her 65ft narrowboat. 8 Responses to Make the SFMGS Boho Spike Stitch Bag! love this bag! what are the finished measurement? So I chain 91, which gives a stitch count of 90. At the end of the first spike stitch row it says end with final tc into top loops of final stitch. There are only two stitches left at the end of the row, so do I just skip one and make a spike or should the original chain be 92 to give a multiple of 3+1 stitches? You should have 1 dc/tc at beginning and the end, but is only 90 total dc/tc I had the same problem and had to redo it. I started with a standing dc/tc. I finally got it to come out right. Hope this helps. How do I incorporate this stitches using one color or a verigated yarn? This would make a really nice blanket. What are the multiplies to make it larger? Thank you!